Paperback, 6.25 x 9.5 in. / 128 pgs / 4 color / 128 bw. 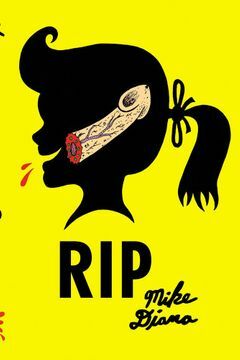 Mike Diana: RIP is a new book of horror, fun, unexpected adventure and disaster from Mike Diana—an internationally known underground cartoonist, and the only artist in America to have received a criminal conviction for artistic obscenity. His run-ins with the law have seemed to have the opposite of the intended effect; since first arriving on the scene in the 1990s with his (in)famous Boiled Angel magazine, Diana has only refined and expanded his vision of a culture engorged and overloaded on greed and violence. This volume, featuring recent cartoons and drawings along with some rare finds from Diana’s archive, features exotic, druggy, disgusting stories in Diana’s inimitable, sharp style—scary and childlike, inflected with a deadly dark humor and punctuated by weird punchlines. FORMAT: Pbk, 6.25 x 9.5 in. / 128 pgs / 4 color / 128 b&w.